Mix all ingredients except pasta sauce just until blended. Shape into 18 (1-inch) meatballs. Place on parchment-covered rimmed baking sheet. Bake 15 to 20 min. or until meatballs are done (160°F). Spoon meatballs into large saucepan. Add pasta sauce; stir gently until meatballs are evenly coated with pasta sauce. Bring to boil, stirring frequently; simmer on medium-low heat 10 min., stirring occasionally. Serve over your favorite hot cooked pasta. Sprinkle with 2 Tbsp. torn fresh parsley. 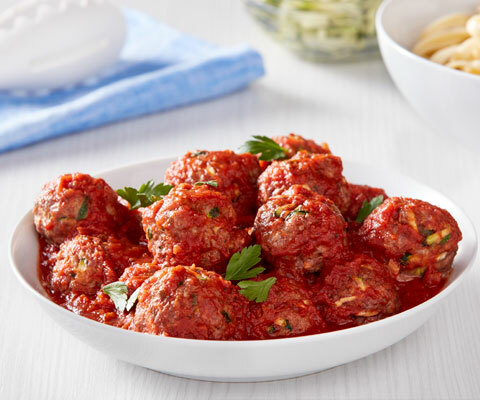 The pasta sauce adds a good source of vitamin A to these delicious, yet low-calorie, meatballs. Prepare using your favorite variety of CLASSICO Organic Pasta Sauce.